Please support imprisoned anti-nuclear and anti-war activists – we need YOU! The Nuclear Resister is a bare bones operation that depends on grassroots support to chronicle anti-war and anti-war resistance, and support the women and men in prison for their acts of conscience. We need your help to continue this work – please read below!! Or go directly here to make a secure online donation. Thank you! Here in the Sonoran Desert, the summer rains have ended, the nights are once again cool and it is the time of All Souls, the day of remembrance of the dead. Up to 100,000 people will soon gather for the colorful, creative, two-mile-long 25th annual All Souls Procession through downtown Tucson. 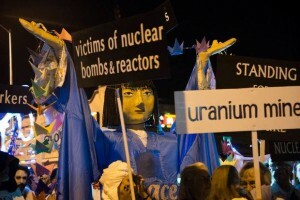 And for the third year in a row, our anti-nuclear contingent will take part in this unique public procession and ceremony to celebrate and mourn the lives of those who have passed. We’ll hand out cards to the crowd that tell the story of Sadako and the 1,000 paper cranes. On the back, the cards have information about groups working for a nuclear-free world. 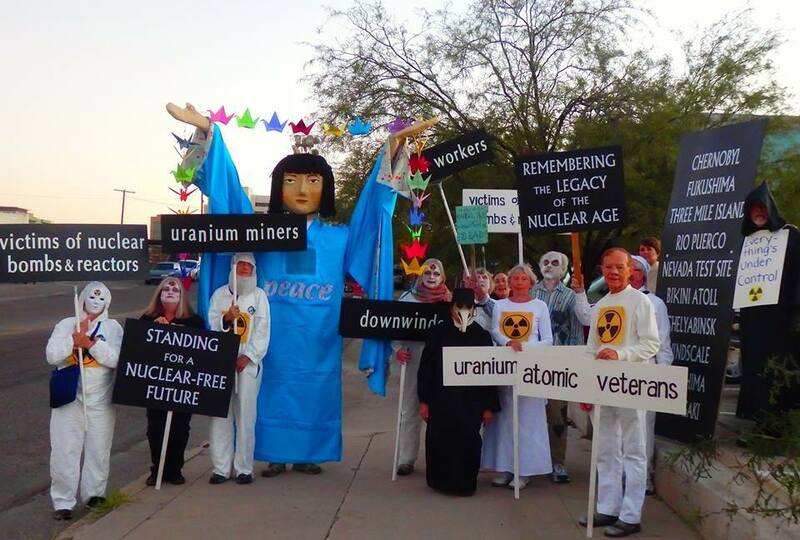 Some of us will carry signs remembering those who have died as a result of the nuclear age: “downwinders”, “uranium miners”, “victims of nuclear bombs and reactors”, “atomic veterans” and “nuclear workers”. Another sign reads “Remembering the Legacy of the Nuclear Age”, while the tallest one lists the names of some of the world’s nuclear catastrophe sites: Hiroshima, Nagasaki, Chelyabinsk, Nevada Test Site, Fukushima, Chernobyl, Three Mile Island, Rio Puerco, Bikini Atoll, Windscale. As we walk, we will also remember the many nonviolent resisters, now deceased, who dedicated their lives to peace and nuclear abolition. When we think about our mentors (Sam Day and Phil Berrigan among them) and of all who have gone before us in the struggle and inspired us, we are filled with gratitude. Presente! We carry on the work of the Nuclear Resister in their names, in their memory… and with your support. As we begin our 35th year of publishing the Nuclear Resister, and look ahead to next August and the 70th anniversary of the atomic bombings of Hiroshima and Nagasaki, we realize that we have reported on resistance to the Bomb and the nuclear industry it spawned for half of the nuclear age. In 1980, both in our early 20s, we shared a commitment to devote ourselves to this cause. We saw the impact of nonviolent direct action in movements for social change throughout history, and wanted to support those who took action for a nuclear-free future even – and especially – when it landed them inside a prison cell. We had no idea that the Nuclear Resister, based on the simple premise of supporting these prisoners and providing information about them to the movement at large (since 1990, including war resisters as well), would continue through the years of raising our family and beyond. But it has, for two important reasons. First, because with humanity still burdened by war and the nuclear threat, the resistance persists. People of conscience in each generation have been and will continue to be moved to act against endless wars, old and new nuclear reactors and enough nuclear weapons to destroy the planet many times over. Second, because your support persists. While our commitment to the work of the Nuclear Resister has not wavered, the truth is we couldn’t have done it without the generous support of countless people over the years. It is because of your subscriptions and donations that we are able to continue editing and publishing the comprehensive newsletter, the monthly E-bulletin and the website, and promote the news on Facebook and Twitter. It is with your help that we will continue to chronicle and network this movement and support the men and women who are in prison for their acts of conscience. • to support, to stand and to act with those who carry it forward, as together we work for the change we wish to see in the world. Checks and money orders can be made payable to the Nuclear Resister. Contributions of $50 or more may be tax-deductible if made payable to the Progressive Foundation, with “Nuclear Resister” written on the memo line. Or you can make a secure online donation here. Each and every donation, large or small, will be gratefully received – thank you! P.S. We would also like to invite you to remember the Nuclear Resister in your will and trusts. Your bequest will help ensure that we continue to report on nonviolent resistance for a peaceful and nuclear-free future, and keep track of who is in and out of prison, well into the future.